In a nutshell, this story is the X-Men meets Sky High with a dash of Plato's Symposium thrown in for good measure. "When having two powers makes you a Super and having none makes you a Normal, having only one makes you a sad half-superpowered freak. It makes you a One." Merrin Grey is a One. She can float, but she can't manipulate the air around her to gain any kind of forward momentum, so she can't fly. And floating three feet off the ground might be kind of cool, but it's definitely not a super power. She dreams of working at the Biotech Hub, where she might unlock the key to unlocking her own super potential, and "fixing" her fellow Ones. But then she meets Elias VanDyne, a One who can manipulate air currents, and when they touch, their half-super powers work together to allow them to fly. Alone, they're half-superpowered freaks, but together, they are more than Super. Together, Merrin and Elias discover that all is not as it seems at the Biotech Hub. 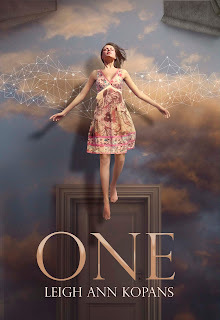 The scientists working to discover the secrets behind super abilities might not be as altruistic as she always believed, and Merrin's dream internship might be a nightmare in disguise. I'll admit, I'm probably not really the typical target audience for ONE. I never read comic books, I'm not a big fan of super hero movies, and I only know who the X-Men are because my sister used to talk about them all the time when we were in high school. But Merrin's story drew me in, and I totally begged for a chance to join LeighAnn's "street team" to help promote ONE. I love the idea that Merrin and Elias were "soul mates" - not in the clichéd, insta-love way that so many relationships form in books and movies these days, but in the way they could do so much more together than either of them could do on their own. They didn't technically need each other, because they were both "fine" on their own. But they're better together, and that's the true test for any relationship, isn't it? Merrin could have lived a full and complete life without Elias. She wasn't pining away as only a half-entity until the moment she met the boy who brought purpose to her drab existence or anything cheesy like that. But Merrin and Elias fit together, each bringing individual strengths and abilities to the relationship to create a whole that was much more than the sum of its parts. Alone, they each had a little bit of something extra. Together, they could fly. I think that's why ONE resonated so strongly with me. I may not have the hidden ability to float three feet above the floor, but I do know what it feels like to be caught in the middle between the popular kids and the average kids, not quite fitting in with one group or another. And like Merrin, I secretly believe that I could be more than I appear to be, if I only knew how to access my own hidden powers. And I'm so grateful for my sweetheart, who brings out the Super in me on a daily basis. *Note: there is some profanity in this book, but it's not excessive, and I still felt comfortable passing it along to my kids to read when I was finished with it. This was a difficult review for me to write, not because I didn't love the book, but because it got me thinking so much that I kept wanting to veer off from the actual discussion of the book to muse on the insights I gained from reading it. But I found this review by Darci Cole that sums up my feelings perfectly, so I thought I'd share that too. This sounds so good. I'm looking forward to reading it!